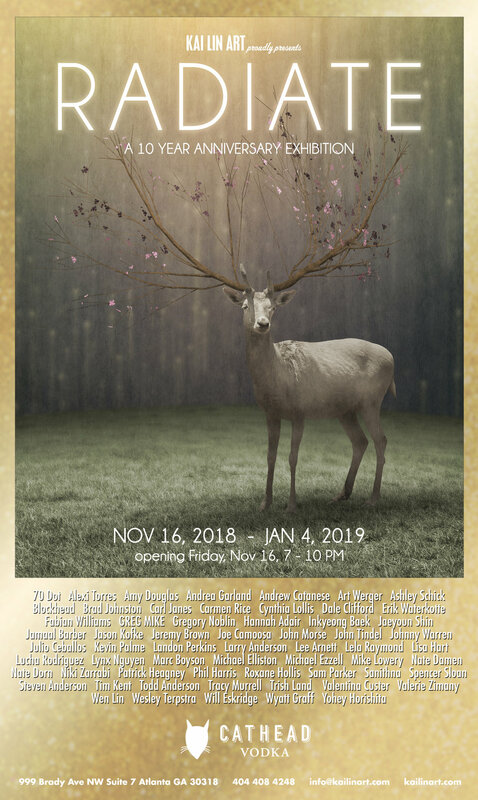 Kai Lin Art is pleased to announce our final exhibition of 2018, RADIATE : A 10 YEAR ANNIVERSARY. Throughout the last decade, we’ve worked and exhibited over 500 artists from across the Southeast and beyond. In this retrospective, we have curated sixty artists from our stable to present artwork that best represents their aesthetic. Many of our Kai Lin Artists are creating fresh new artworks for this exhibition. We are so grateful for your support and dedication to the arts. Thank you to all the patrons, collectors, artists, curators, museums, corporations, consultants, and creatives that have come through our gallery doors. It is because of your support that we can continue on our trajectory to keeping art alive in Atlanta.